Born in South Africa in 1936, Margaret Calvert moved to London in 1950 with her mother and sister to complete her education. It was at the Chelsea School of Art, while studying illustration and printmaking, she met Jock Kinneir, who had been recruited to give illustration students an introduction to graphic design. He had recently left Design Research Unit where he had been working alongside Misha Black on exhibits for the Festival of Britain. When Jock Kinneir set up his own design practice Margaret Calvert became his assistant, initially to work on the signing for, the then new, Gatwick Airport. This was closely followed by collaboration on the radical reworking of Britain’s road signs. Projects completed before David Tuhill, a recent graduate of the Royal College of Art joined the partnership to form Kinneir Calvert Tuhill Limited, included the design of lettering and signing systems for British Rail and the British Airports Authority. Her typeface ‘Calvert’ initially designed for the Tyne and Wear Metro is now used in conjunction with the ‘Calvert Brody’ type by the Royal College of Art. More recently she designed ‘New Rail Alphabet’ a digital version of ‘Rail Alphabet’ and ‘New Transport‘, a digital version of the original ‘Transport’ lettering for the UK Government’s web site; both in collaboration with Henrik Kubel, one of her former Royal College of Art students. She also acted as Consultant to Henrik Kubel and Scott Williams of A2 on the design of fonts and pictograms for Moscow’s Metro. From 1987 to 1991 she served as Head of Graphic Design at the Royal College of Art, retiring as Senior Tutor in 2001. She continues in private practice working from her Islington, London based studio. 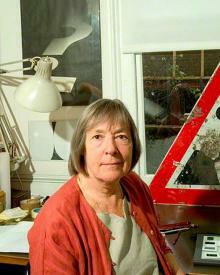 In 1976 Margaret Calvert was elected a member of the Alliance Graphique Internationale; and in 2004 an Honorary Fellow of the University of the Arts London. In 2006 she was awarded an Honorary Doctor of Letters from the University of Brighton; and in 2016 received an Honorary Doctorate from the Royal College of Art. She was elected an RSA Royal Designer for Industry in 2011, and has just been awarded an OBE in the 2016 Queen’s Birthday Honours.